The Saint Bernard is one of the largest dog breeds and also one of the most lovable dogs around. This giant dog is muscular and powerful, yet has a gentle and loyal disposition. The Saint Bernard tends to get along quite well with children. However, the breed might not always realize its size, so be cautious at first. Overall, Saints have the natural instinct to protect and assist people, making them wonderful assistance dogs and affectionate family pets. Coat and Color: Coat may be short and smooth or long and silky. Colors include white with red, brown or brindle markings. A black "mask" is typically seen. The Saint Bernard is a legendary hero of the Swiss Alps. Dating back over 1000 years, the exact origin of the breed is not certain. Some sources suggest that Saints emerged from large Asian dogs brought to Switzerland (perhaps the Tibetan mastiff or similar) by Roman armies. These molossers were bred with native Swiss dogs. The breed was named for Archdeacon Bernard de Menthon, who founded a hospice in the Swiss Alps as a refuge for travelers. For centuries they were developed by the monks as companions, watchdogs, and workers that saved thousands of human lives by finding and assisting lost or injured travelers in the Swiss Alps. Their highly developed sense of smell allows them to track lost people in the snow. The Saint Bernards employed at the monastery were shorthaired until 1830. At that time, there was severe weather for two years and it convinced the monks to crossbreed Saint Bernards with longer-haired Newfoundland dogs. However, the longer hair got ice matted in it and the monks gave away any longer-haired pups. The working Saint Bernards at that time were smaller than today's giants. They were last used for rescue in 1955 but 18 of them were maintained at the Great St. Bernard Hospice for tradition until 2005. The breed was officially recognized by the American Kennel Club (AKC) in 1888. The popular rendition of a Saint Bernard with a cask of brandy around its neck is not historically accurate. This myth is believed to stem from the painting "Alpine Mastiffs Reanimating a Distressed Traveler" by Charles Landseer. They never actually wore small casks of brandy, which would not be medically recommended in any case. Saint Bernards in popular culture include Nana in "Peter Pan" movies, Neil in "Topper," Buck in "Call of the Wild" movies, and Beethoven and Cujo in movies of the same name. The Saint Bernard will either have a short, smooth coat or longer, silky coat. Both coats require routine grooming, but the long-haired variety should be brushed out more often. This breed has a relatively high shedding rate which can be controlled with regular hair brushing. Be sure to clean their ears regularly to prevent ear infections. Though an active Saint's nails may wear down on their own, check the nails at least monthly to make sure they don't need to be trimmed. Also, take note that Saints are likely to be on the slobbery side, so you may need to keep a "drool rag" handy. Although they may seem easygoing at times, routine exercise is essential to keep your Saint fit and stimulated. They need a good walk each day. Many health issues can develop if your Saint becomes overweight. Like all dogs, proper training and socialization are both very important for Saints and must begin when they are puppies. Due to the dog's giant size, you must be able to control your dog at all times. Pay careful attention to the prevention of jumping, leaning, and leash-pulling. Saint Bernards enjoy cold weather but do not do well in hot climates and may suffer from heat exhaustion easily. Don't take them for a walk in the heat of the day and provide a cool place for them on hot days. It is possible to keep a Saint Bernard in an apartment as long as you take him for a walk each day. But it is good to have a yard where he can roam a bit. They tend to pick up dirt and debris. A Saint Bernard will need 5 to 6 cups of dry dog food per day, which you should divide into two meals to reduce the risk of bloat. If they gulp their food and eat too much they may have gas production. If the stomach twists, it can cut off the blood supply and lead to a medical emergency. Puppies need to be monitored and kept lean as they grow so they don't put on weight too quickly. Adult Saint Bernards can become obese and this will lead to a shorter lifespan and joint problems. Discuss this with your veterinarian to get recommendations on feeding schedules, amounts, dog food types, and exercise to prevent obesity. 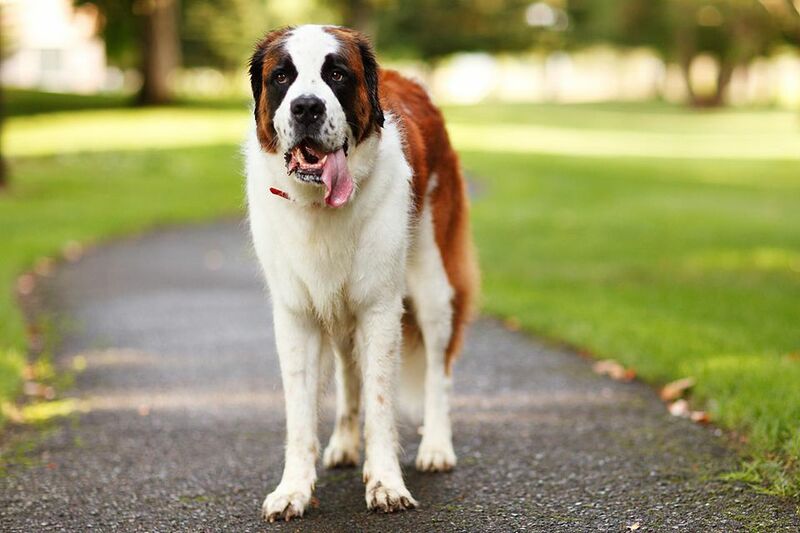 Be sure your Saint Bernard has access to fresh, clean water, especially on hot days. No matter the breed, it's important to do your research before you get one. If you think the Saint Bernard is the right dog for you, be sure to do your homework. Talk to other Saint Bernard owners, reputable breeders, rescue groups, and your veterinarian to learn more.